Brown rice a soluble fiber food. Most health-conscious people know that fiber is an essential part of a healthy diet. Unlike insoluble fiber, soluble fiber is dissolvable, forming a gel-like material. It can typically be found in citrus fruits, oats, peas, and barley, among other foods. The best sources of soluble fiber are plant-based sources. The best best vegetables sources include dried beans, legumes, peas, and carrots. Other foods include oats, flax seed, citrus fruits, like oranges, tangerines, and grapefruit, as well as apples and barley. In reality, your best soluble fiber sources will be found in virtually any plant food, but of course some plants are better than others. For example, root vegetables can be both soluble and insoluble. The outer skin of the root would be considered insoluble, but the inside of the plant is generally soluble. Potatoes, sweet potatoes, onions, beets, and carrots are excellent examples of this theory. Don't just stick to root vegetables as a soluble fiber choice, however. Broccoli is another great soluble source, and broccoli is easily incorporated into a variety of vegetables or simple to fix alone by steaming or stir-frying in a small amount of olive oil. Artichokes also offer loads of soluble fiber to your diet. While vegetables are certainly a good source of soluble fiber, there are also many fruits available that are both delicious and good for you, too. Plan on incorporating a variety of fruits into your daily diet, like apples, bananas, oranges, and berries. Other fruits that are full of soluble fiber include grapes, peaches, prunes, pears, and plums. While fruits and vegetables are important soluble fiber sources, dried beans, peas, barley, oats, nuts, flax seed, and rye are also wonderful sources. Look for ways to incorporate these into recipes you already have on hand, or search for new recipes that are high in soluble fiber as well. Start out slowly. Too much fiber all at once when you aren't used to eating it can cause an upset stomach. Start each day with fiber. 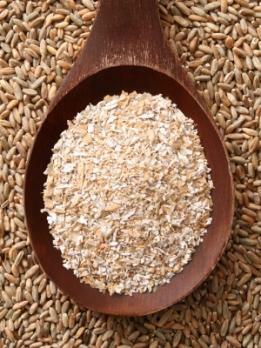 Either choose bran cereals or breads or add some unprocessed wheat bran to the healthy cereal of your choice. Choose whole grains. Breads, rice, cereal, and pasta should be whole grain based. The ingredient "whole wheat" should be the first ingredient you read on the nutrition label. Watch how you bake. Choose whole-grain flour over white flour, and consider adding unprocessed wheat bran or crushed bran cereal to your cake, cookie, or muffin mixes. Get creative. Look for opportunities to add more fiber into your diet by adding chopped veggies into sauces and stews. Add kidney beans and other legumes and lentils to salads, soups, and nachos. Choose whole-wheat chips over processed chips. Snack wisely. Avoid sugar-filled cookies and candy, and choose fruits, raw veggies, and nuts. Finally, while an average diet should include both insoluble and soluble fiber, don't worry about choosing one or the other but instead concentrate on changing how you eat to incorporate both kinds of fiber throughout your day. Atkins Diet Food List By Erin Coleman, R.D., L.D.